A little-known Chinese company called 10moons (whose logo, by the way, bears a close resemblance to Lenovo's) has launched a tiny computer that could well be the precursor to a new generation of dual-booting, affordable computers. The D9i appears to be carrying both Windows 8.1 and Android 4.2, allowing you to choose between the two operating systems. A previous attempt by Asus to get the two OSes on one device was canned after Google apparently vetoed the release of the Transformer Book Duet TD300 Hybrid. This time around is slightly different as Intel may be behind the move (there's a big Intel inside logo prominently displayed), meaning the CPU maker wins regardless of whether the OS is Android or Windows. Plus for the time being, this RMB499 (about £52/US$81/AU$93) device is only on sale in China. You can expect many more of these affordable devices to be launched soon, especially if Microsoft chooses to support it (and why shouldn't it?). 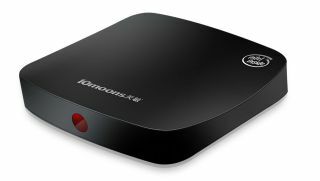 Physically, it looks like a Now TV box but in black and with rounded edges. It carries the same standard component as a tablet but without a screen, cameras and a battery. Essentially, it's a bigger version of a cheap Android dongle but runs Windows too. It gets you a quad-core BayTrail Intel Z3735D processor with 2GB of RAM, 16GB onboard storage, 802.11ac Wi-Fi, a microSD slot, two USB ports (including a USB 3.0 one), HDMI plus a remote control.